Another piece of the jigsaw in understanding how neutron stars work has been put in place following the discovery by scientists of the origin of the high-energy emission from rotation-powered pulsars. Pulsar systems containing neutron stars accelerate particles to immense energies, typically one hundred times more than the most powerful accelerators on Earth. Scientists are still uncertain exactly how these systems work and where the particles are accelerated. Now a team of researchers from the UK and Italy, led by Professor Tony Dean of the University of Southampton, has detected polarized gamma-ray emission from the vicinity of the Crab Nebula - one of the most dramatic sights in deep space. By using spectroscopic imaging and measuring the polarization - or the alignment - of the waves of high-energy radiation in the gamma-ray band, they have shown that these energetic photons originate close to the pulsar. The Crab Nebula is the result of a supernova explosion which was seen from Earth on 4 July 1054. The explosion left behind a pulsar or rotating neutron star with a nebula of radiating particles around it. The neutron star contains the mass of the Sun squeezed into a volume of about 10 km radius, rotating very fast - about 30 times a second - thereby generating magnetic fields and accelerating particles. A highly collimated jet, aligned with the spin axis of the pulsar and a bright radiating torus around the pulsar, are also seen. The Crab is known to accelerate electrons, and possibly other particles, to extremely high energies, both along the jet and around the torus, where they can be traced in the gamma-ray domain. Looking into the heart of the neutron star with a gamma-ray telescope on the European Space Agency's INTEGRAL spacecraft orbiting Earth, the researchers made a detailed study of the high-energy radiation to assess their polarization. They deduced that the majority of the gamma-rays are derived directly from the jet. They analysed data from over 600 individual observations of the Crab by the INTEGRAL spectrometer to assess the polarization of the gamma-rays and compared this data to the output from a sophisticated computer model. The results show polarization with an electric vector aligned with the spin axis of the neutron star, demonstrating that a significant fraction of the high-energy electrons responsible for the polarized photons are produced in a highly ordered structure close to the pulsar. 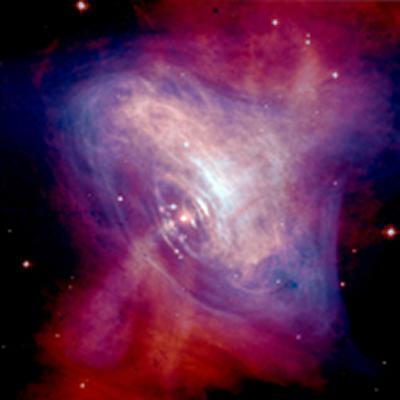 Professor Tony Dean of the University's School of Physics and Astronomy comments: "The remarkable alignment of the electric vector with the rotational axis of the pulsar, together with its similarity to the optical polarization angle, suggests that both fluxes originate at the same site close to the neutron star. The findings have clear implications on many aspects of high-energy accelerators such as the Crab." The result also may have profound implications for fundamental physics. Some theories of quantum gravity have predicted that at very short distances a particular direction in space would be picked out, breaking Lorentz invariance. A consequence of this would be that the polarization vector of light would slowly rotate as it propagated through space. The Crab Nebula has a well known rotational axis and now the first measurements of the polarization of gamma-rays have been shown to be aligned with it and not rotated away from it. This very strictly limits non-Lorentz invariance. The paper Polarized gamma-ray emission from the Crab is published in Science. The authors are: A. J. Dean, D.J. Clark, V.A.McBride, A.J.Bird, A.B.Hill and S.E.Shaw from the University of Southampton's School of Physics and Astronomy; J.B. Stephen and L. Bassani from INAF-IASF, Bologna; and A. Bazzano and P. Ubertini from INAF-IASF, Roma.